Cardiff boss Ole Gunnar Solskjaer hopes their vital 1-0 win at Southampton could be the spark that ignites their relegation survival battle. Juan Cala's 65th-minute goal brought the Bluebirds to within three points of Norwich City, after the Canaries lost to relegation rivals Fulham. "That will give us a lot of belief.... every single game now is a cup final for us," Solskjaer said. "Finally we get a result from a good performance." Southampton dominated possession at St Mary's Stadium, but were perhaps hampered by the absence of Jay Rodriguez in attack, after the England striker ruptured his anterior cruciate knee ligament last week. 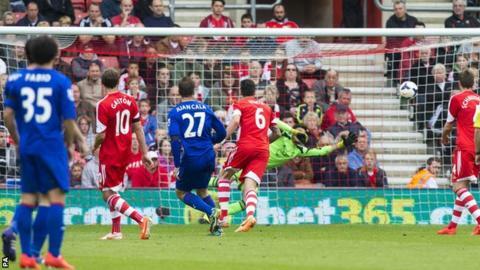 Even without their striker, Cardiff goalkeeper David Marshall had to be on top form to deny goal-bound efforts from Gaston Ramirez, Sam Gallagher and Nathaniel Clyne. But when a corner was only half-cleared, Cala showed great composure and no little skill to bring the ball down and make space for himself before curling an exquisite left-foot shot past Paulo Gazzaniga. "Today we matched Southampton in belief, in effort and of course the defending was fantastic," Solskjaer added. "It was a fantastic goal, he [Cala] is a great technician;. He's a leader and he took it really, really well - he's very composed on the ball. "That was important, that we played football and played our way. "Sometimes it looked like we might just conceded one or two goals because we overplayed, but why not? "It is the start and let's see if it ends up with a miracle. A performance like today is what we need every single Saturday, and two Sundays. "The atmosphere in the changing room was great afterwards. "Before today I don't think many expected us to come here and take points. We were six points behind, now we're three points behind. "We have four games to go. Fulham, Swansea, Norwich and West Brom are still in it with us, but we've just got to do our job. "We still need some help but it's been a wonderful week." The win was a bright end to a turbulent week for Cardiff, with last Saturday's crushing 3-0 home defeat to Crystal Palace compounded by claims their team had been leaked to the London club. The Welsh club are understood to be taking disciplinary action against two employees over the matter. "We'll keep that within," Solskjaer said. "We're dealing with it as a club and we move on. "We've had issues, I've dealt with it and the players just focus on the football. I can focus on the rest of it. "We ended this week on a high and it is back to square one next week because it is about performing on the day."